I though I would start a new thread for the 8in1 bed. 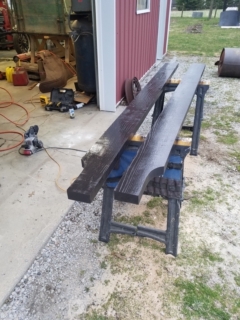 I have the new 2x6 1/2 runners cut and painted to mount to the frame. 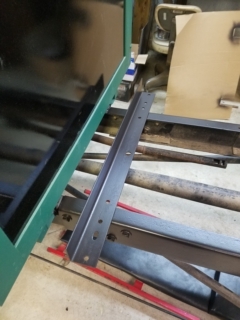 I am in process of lenghtening the 1/2 square head bolts to mount the runners. Spent most of today blasting nuts and bolts. Here are some photos of the bed. All the floor needs replaced and misc. Other wood will be replaced as needed. You will have to wait to see its many features as it is just sitting on the horses. 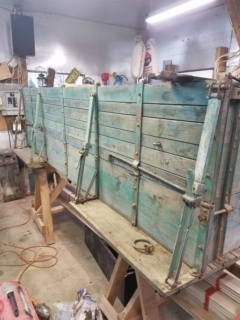 The livestock gate for the rear and tailgait as well as extensions for stock racks front and rear are not shown in these photos. I will post what little info I have on it at a later time. I have a sales brochure that Davis Stroud had when I got it from him. 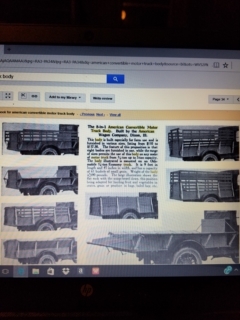 If anyone has any info on the 8in1 convertible truck body I would like to see it. Dallas, that bed looks pretty good, very interesting. It will be interesting to see how it works. What kind of wood does it use? That is a very neat setup. Mack, the sides are poplar and the floor is ash I think. The floor is hard to tell but when I split one open it looked like ash grain inside. 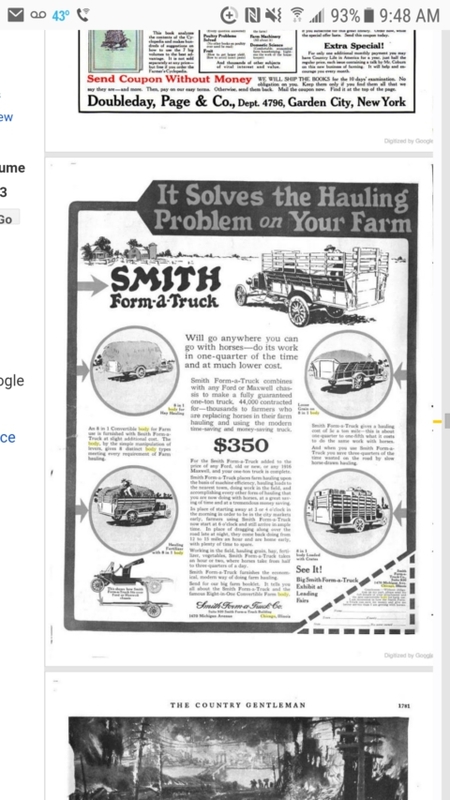 Looks like the 8in1 was sold by Smith for a Truck company. Needed longer mounting bolts. I had these. 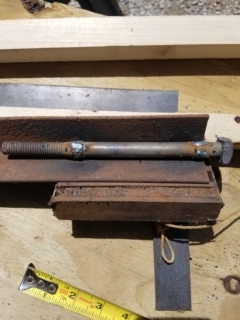 So after cutting grinding to a semi point and adding in some 1/2 inch round stock I found my bolt stretcher. Great project. Can't wait to see it all mounted up and in action. 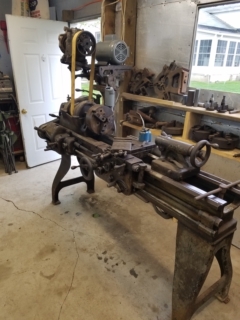 Well its been a while,but I am finished setting up my 1920 Rockford lathe. I had to move alot of things around in the shop to get lathe in. Back to work on the 8in1. And here is the lathe. Thanks for posting the updates. 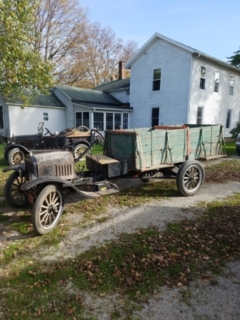 Would probably make a good story for "The Vintage Ford." Recommend you save some of the before photos at high resolution so they can be printed. Hap,I am going to put a photo album together when complete of MP cab and 8in1 bed to keep with the truck. I have to order elevator bolts for the bed floor. I will have to turn the heads on them to 3/4 inch as the 1/4-20 bolts they sell now are 1 inch heads. The details on hardware is the time consuming part of these builds. 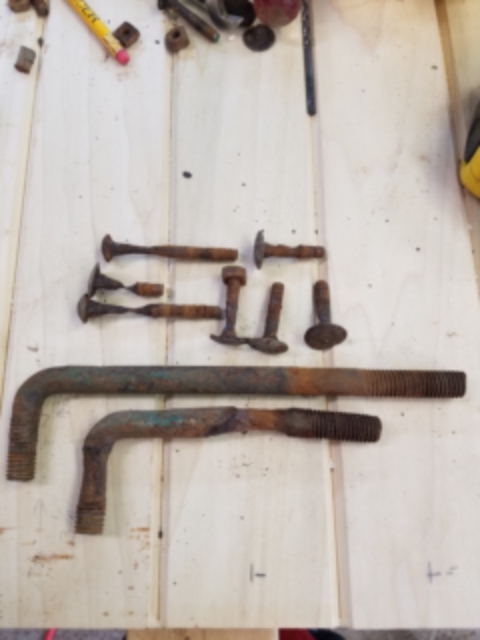 There are alot of bolts in this bed. Lucky the sides are in pretty good shape. The bottom boards on the sides need replaced and I counted 20 bolts on each side to replace bottom board. 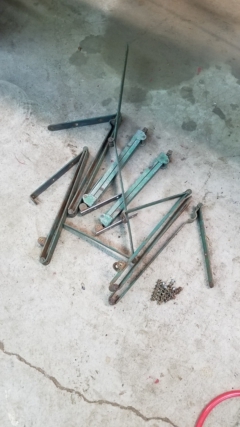 There are 60 elevator bolts in the bed floor and at least that many slot head screws. 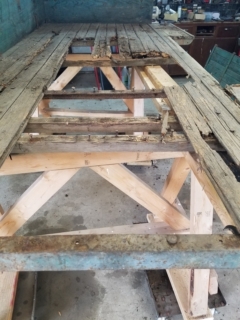 The floor supports are a mix of wood and angle iron. Some of the iron work on the bed will have to be replaced as some are rusted through. All the iron damage is confined to the floor. I will post more as progress is made. We will look forward to the updates! The story would be good,but i recomend the tour!! Good on ya Dallas! Bud. Are you coming down this was this summer? Dallas,I hope to!!!! Has your friend did anything with the car in the warehouse? Bud. 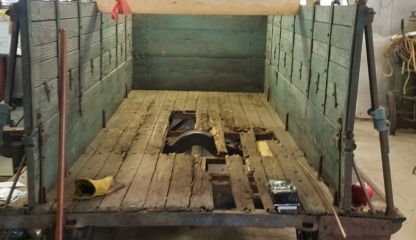 Not many bolts in the bed floor were saved. These are the ones that came out in one piece. New and old. The sides are in much better shape. Waiting for bolts and screws I ordered and blast a few parts before assembly and paint. You got a lot of goodies with that ol' Rockford! I see that big (block?) plane on top and the carpenter's horses below. Haha! Plant some goodies for the shot just so. Cool! Me too sometimes. That new floor looks fantastic! What the heck are the tall "L" bolts for? Fastening the "walls" to the floor? Duey, the Dykes is about 1916 if I remember right. 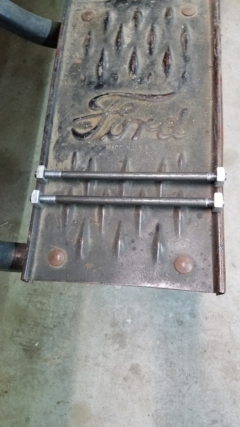 Yup, the L bolts hold the side panels on the bed. The plane was a garage sale find for $1. 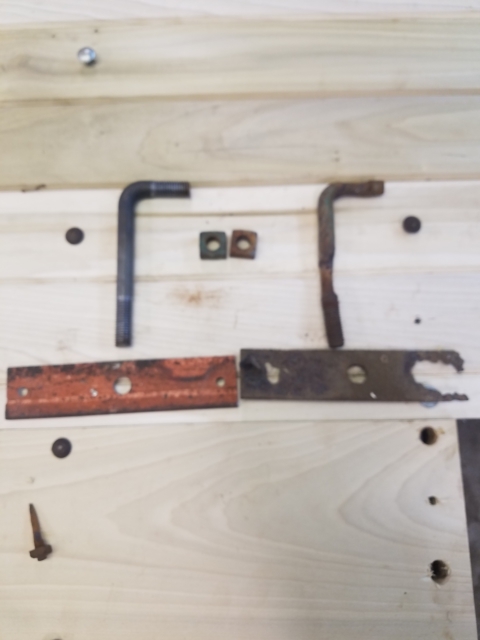 Being a carpenter I have a collection of old wood working tools or old junk as my wife calls it. I use them from time to time as needed. I had the Dykes out showing a buddy along with MTFCA books on T's. 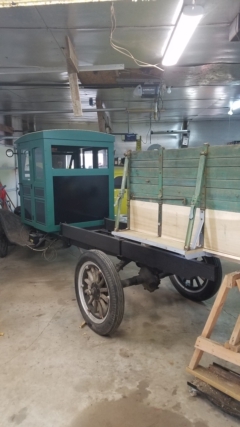 I am going today to help a guy understand a T he inherited from a family member and has no clue how to start or drive it. My 1st suggestion will be to get on this forum. Plugging along on the bed. 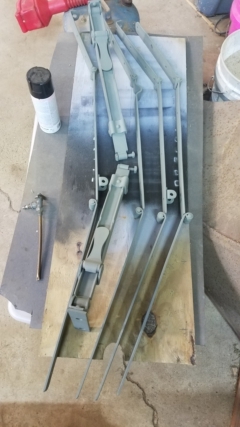 Blasted the metal parts of the floor system and primed with etching primer. There were not 60 elevator bolts to turn down. There were 70! Along with 70 wood screws,34 carriage bolts,18 1/2 inch square head bolts and 10 1/2 inch L Bolts and all the square nuts. All blasted or replaced. 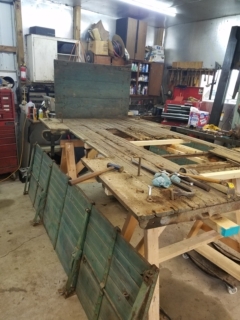 I havnt started the sides yet but only the bottom 12inch boards need replaced. Only about 30 bolts and screws per side. All new wood cross members except one that was still good. Just an update. I hope to have it ready for OCF. Where else could you have that much fun? Dallas, the progress you have made is fantastic. I guess you were right about all the hardware. your reproductions look great. Now, just imagine if you had to drill all those holes with a hand crank drill? I have a couple of them and I have used them a few times just for kicks and giggles. There are a few things about the old days that I do NOT long for. 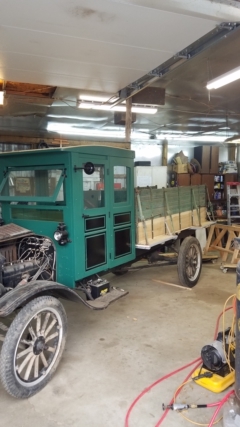 Looks like you are doing an excellent restoration on that truck with wonderful attention to detail! Richard I spent 11 hour yesterday in the shop. Dan that 1920 Rockford lathe is fun to use. Not work when you have cool toys. Wayne I think about that all the time. I have to admit, installing 70 wood screws with a screwdriver is not my idea of fun. Those guys must have had arms like Popeye. The new screws are very soft compared to original. I had to use wax on them to keep from turning out the slot in the head. I use original when I have them but I just didnt have 70 of that size. Good point about modern screws. Too darn soft steel. Hmmm, how many wiped out slots do we see when taking something old apart? Not too many eh? Summer is very busy for me but I have managed a few hours in the shop. That looks like fun!! I would love to do a project like that. Dave, I was hopefull but the time is running out. Life and work gets in the way. I will take the RPU again. Factory built trucks are the feature vehicle this year so I guess it qualifies. The TT will be ready next year. You should plan on going next year and you can drive it again. Don, you are welcome to come help. It would end up with 4 doors though if you were to work on it. Dave Im glad you took care of it for all those years. It could have been scrapped or parted out like alot of others. I only hope I can do half as well. My TT is sitting waiting for cooler weather. It has been brutally hot here in S/W Missouri. Gordon its cooled off! 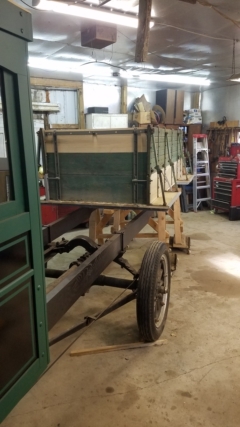 I have made it back to the shop and made some progress. My son helped me set the other bedside on this morning. Photos coming soon. The fenders are going to be the real challenge. I dont have anything to reference. I guess if no one knows how they are suppose to look I cant mess it up. I want them to look like express bed fenders. Some detailed photos of express bed fenders would help. Hint Hint? Im loving this lathe. 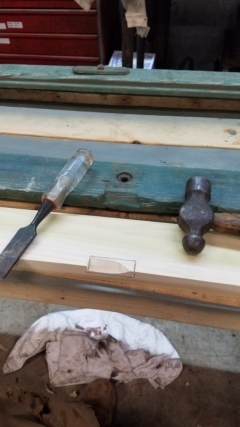 When I need to make hardware I dont have to drive 8 miles to a buddys shop. He has a roller to get the shape and a bead roller. I will have to make the dies but thats part of the fun right? Dies? All you need is a 60 degree? cutter and you make your own threads on the shafts and bend the L after. Set the quick change box to 12 or 13 thread or what you wish for and cut them in. Pass by pass by pass by pass by pass by pass. On my OLD lathe, I made water pump packing nuts for an old tractor and cut the six sides after. I enjoyed those evenings with my OLD lathe. Fantastic to see progress on that very odd 8 in 1!!! Thanks Dallas! Buddys are coming over at 2:30 to help set the bed onto the chassis. I can get inside to remove bolts and disassemble sides to finish all the parts. 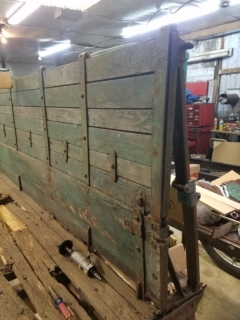 Only about 125 nuts and bolts to restore and about 80 screws. 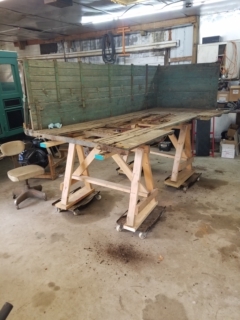 It has been on saw horses for months. With wheels I can move it around but working inside is not that safe. I want it bolted to truck. It will come off for paint but that is a couple months away. Amazing work. I'm looking forward to the next steps. Woo Hoo finally on the chassis. Just a couple of bed configurations. More to come when more parts are added. Try Blacksmith Bolt in Portland, Oregon. He has a lot of the old fashioned blackened bolts for your kind of project. I buy our #9 wood screws from him. 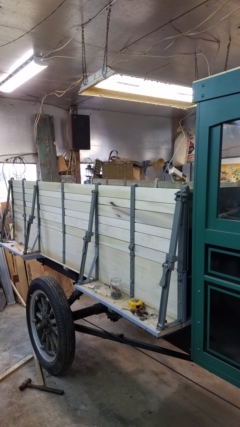 How does the front of the bed attach to the chassis? I imagine the 8 uses they had in mind are listed in the ads you posted, but they're too small for me to read. Could you take a minute and list the 8 uses please? I'm very curious about this. The truck looks GREAT!!! I, like most of the others reading this post, am jealous. You're doing a really good job. Very neat truck and it�s lucky to have Dallas looking over it ! This afternoon I will be burning my M-P bed ! Henry, it is a stock rack in a couple positions to haul livestock. It is a grain bed straight side or flare side. 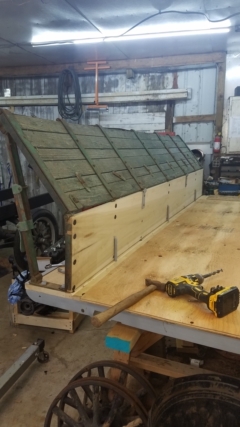 The sides will lay flat for hay or crated fruits and vegetables. The position with sides in L position as in latest photos is for hay bagged goods or seating. I have stock racks for front and rear. I am missing the wedge shaped pieces for the flare side grain bed. The bed weighs 690 lbs. 9ft long and 45 inches wide inside the box. In the add I posted it is mounted on an oldsmobile 3/4 ton economy truck. 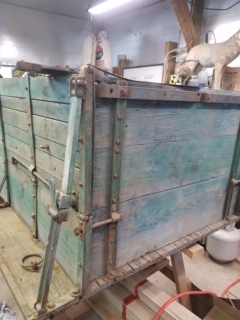 The box has a 3 ton capacity of small grain. It is all done with 3 piece hinge on the sides and slide latches and swivel rods with hooks. Turn this,slide that and hook this to that. Pretty complex engineering to make it all work and be strong enough not to bend or break yet light enough to be feesable for a light duty truck. Tim put down the matches and step away my friend. I can send you photos and you can build an 8in1 for yourself! 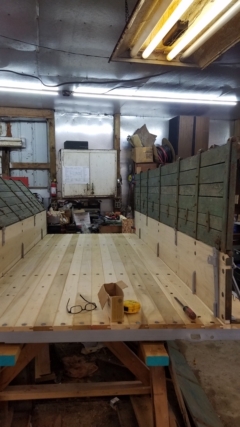 How about some photos of that MP bed? Thanks Dallas. Boy, the guys who designed it must have really spent some time on experimenting with all the variables. Very cool!! Henry, they started with 2in1 and 4in1 and 6in1 beds. If I remember correctly it started with wagon bodies. I forgot the top section of stock rack folds over bed to make an enclosed crate for goats and sheep and such. This is the cadilac of the convertible truck bodies. If anyone knows of any of these beds I would like info. Dave Stroud said there is one in South Dakota in a museum and I have heard of one other in Iowa privatly owned. 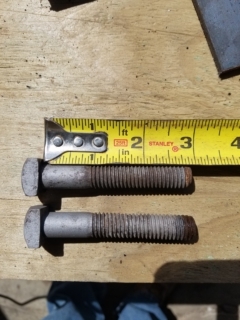 I found 2 bolts about 7 inches long. The bolt was made of round stock threaded on each end. 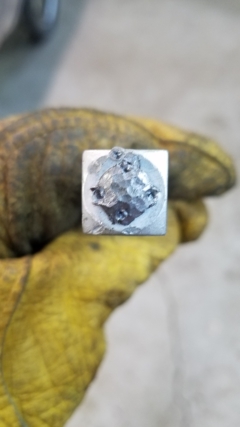 The one end was hammered and staked for a bolt head. 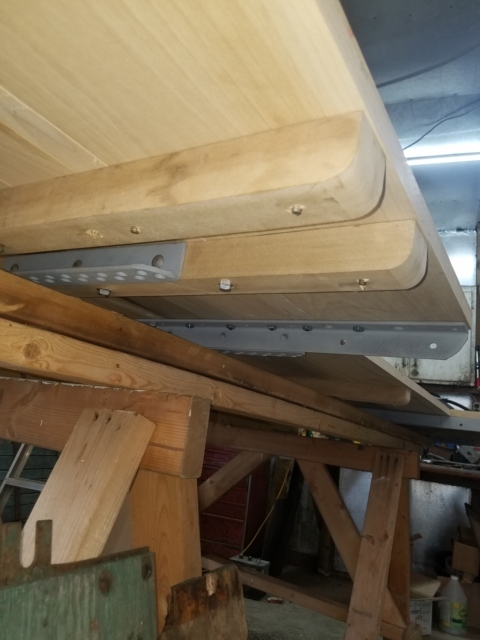 I needed sixteen 3/8x8 square head bolts with nuts for mounting the bed. So I decided to make them as they did in building the bed. Way fun Dallas. I actually thought about traveling (yikes!) to see your truck when you're done and in showing mode! You didn't cut those threads on your Rocky did you? Perhaps you found a threading die. That's fantastic! Dave, you did find the right caretaker! It is the Swiss Army Knife of truck bed's!! Good on ya! Duey, you are welcome anytime. Drive mode is what Im looking forward to. The 1/2 inch square nuts on the bed have what looks to be chisel marks on all four sides. Im sure it is to make them locking nuts. Since I chased threads with a tap, they no longer lock. 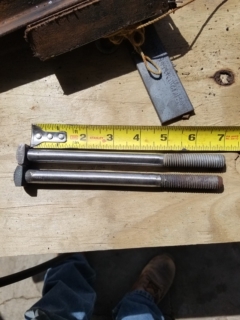 Im wondering if this was done with the nut on the bolt or before. I need to make more locking square nuts so I will try it and see. Gonna be awesome to see it in person at OCF next year! I'm going to want to help convert it into all 8 bed designs while we're there. Maybe they will let you change the bed a few times during pass in review? Well I took the plunge to do it right after some encouragement from you guys on another thread. This is what I got done after work tonight. Tomorrow its blasting and primeing time for the pile of parts on the floor. Tapped the nuts already and will run the die on the bolts tomorrow. I only broke 3 bolts so I only have to make 3. I have 5 of the 7 hinges primed and ready to install along with metal edging for top board. 23 screws in each one. The boards on side panels are in worse shape than I realised so probably going to replace those as well. Some of the boards have rivets in the ends so that should be fun. I will try to post photos later. Still pluging along! 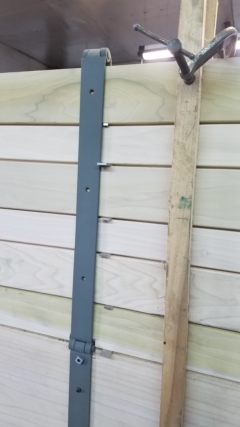 The metal edging on top board. 5 of the 7 hinges for bed side. The side boards that need replaced. I also discovered thar the heads on original elevator bolts, the heads are not centered on the shank. 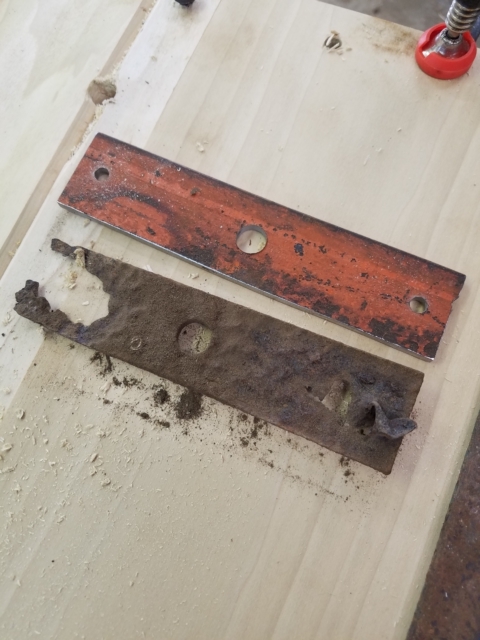 Reusing these bolts in original holes in the side boards would be an extersize in trial and error. I have original nut and bolts restored to use with the new side boards. 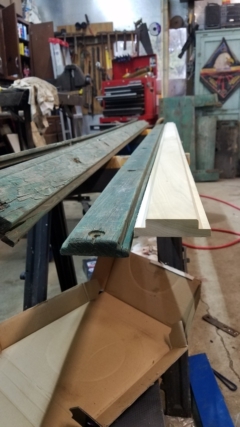 I have the lumber to make the new sides. 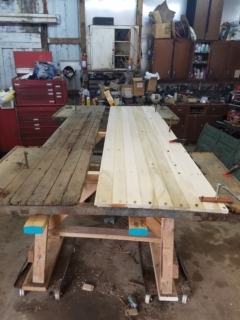 I finished removing boards on one side for patterns. 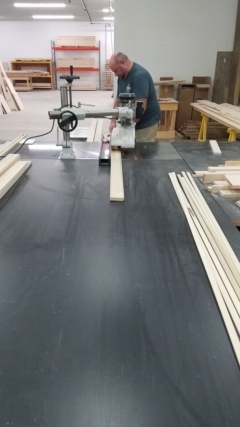 Saturday I will make all new sideboards. Photos will be taken. 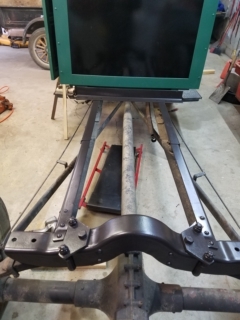 I have to get some measurements of the cab floor for a fellow forum member. 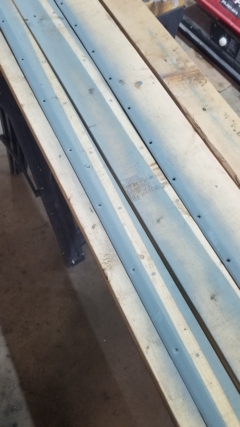 Dallas, how are the joints on the side boards made? They look to be lap joints rather than tongue and groove. Yes Allan, lap joints. Lap on both edges. One board facing in and one facing out. It looks like two sizes of boards but they are all the same width. Thanks Dallas. It looks like the outside lap is at the bottom, so that rain would be shed outside the load. 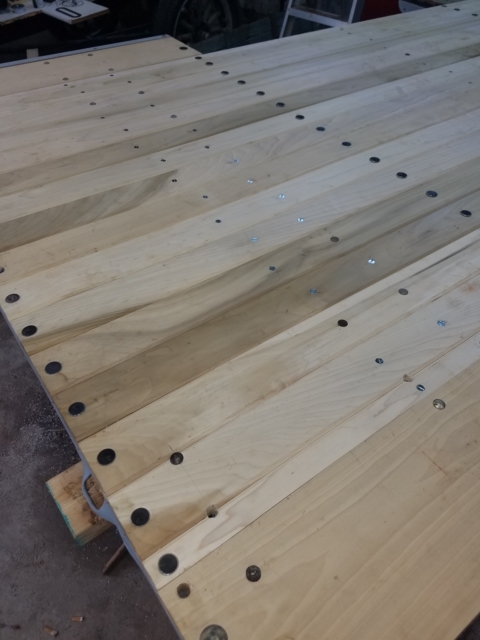 The use of lap joints allows for expansion/contraction due to moisture in the timbers, without there being any adverse effects. Timbers cramped too tightly or having tongue and grooved joints will give problems if the they have no room to move. 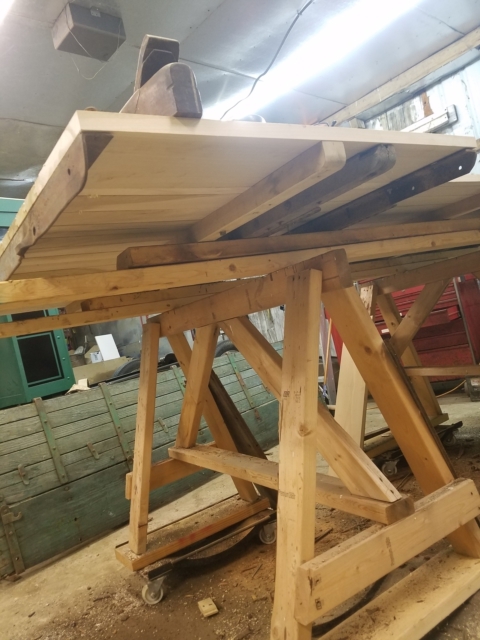 I finished all the boards for sides today. Its tuff to work in such a poor equiped shop but I managed to get it done. 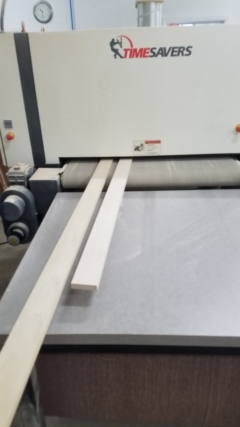 My buddy that owns the joint was ripping boards for me and then to the drum sander. A few photos of the finished product. Oh yeah, looking good, carry on !! Dallas, that's not what I expected. Usually a lap joint has the laps on opposite sides of each board, rather than both on the same side as yours are. With the sides of you bed vertical, one joint would shed water, the next would admit it. Is there a practical reason for the way they are made. It would allow easy removal of alternative boards if that was required for a particular function. Thanks David, I missed that in the photos. It all makes some sense now. I wonder just how practical some of the 8 uses may be. In trying to make it do all things for all applications, it might just have become too bothersome make some of the alterations. I can well imagine some of those side boards never having been removed, or just the ones on the top half. None of this detracts from Dallas's efforts to do such a complete and faithful restoration. It is a wonderful old thing to see, well worth his concerted effort to do it absolutely authentically. Dave is correct, those 3 piece hinges are what makes it all work. The 1st strap hinge bolts to the wide board at the bottom of the bed. 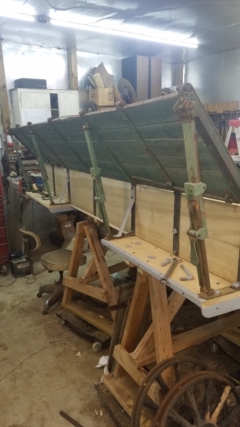 The second strap hinge bolts to 1/2 the boards skipping every other board. The 3rd strap hinge bolts to the other 1/2 the boards. 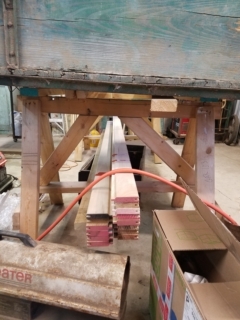 The photo of the boards on the saw table shows how they fit together for a grain box. Unlock the hinges and every other board comes apart for the "L" shape to make a wider bed. Also stands up for stock rack. When its together I will try to post better photos . Quick bite for lunch and post a couple photos. Notching board for the hinge, probably the way it was done then. David, now I have it! 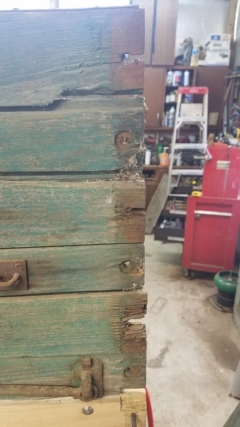 I hadn't made connection on how the hinges worked. Indeed, not much involved in getting things set for different purposes. Quite ingenious. Beautiful wood work. 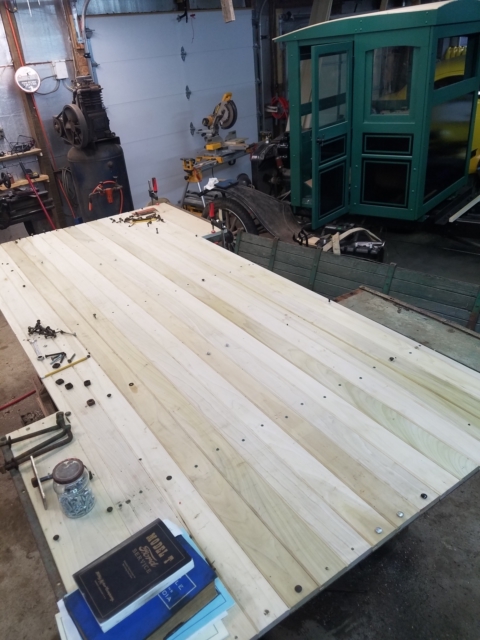 How many board feet of lumber have you used so far? Thomas I have not kept track. The bed is 9ft long, 45 inches wide and 29 inches high. The cab, I have no idea. I try not to think about it too much. I have enjoyed bring it back to usable condition. 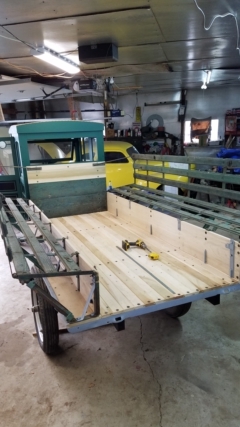 What I did count this morning while tinkering is the bolts in each bed side. Just the operating part. 85 nuts and bolts and 23 screws. The bolts have all been in and out at least twice and will be one more time for paint. 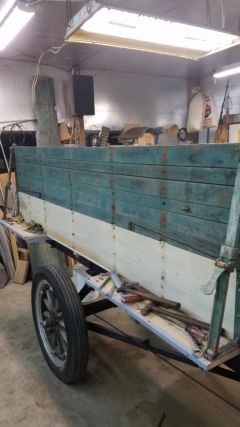 I have one side ready for paint and one to go. I spent yesterday blasting and priming metal bits. I hope to have the bed ready for paint by New Years day. David S, That, to me, is one of the most important parts of this hobby. 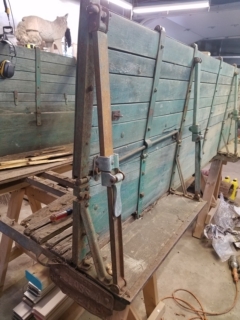 Saving pieces and moving them on to someone that can use them in a proper restoration. 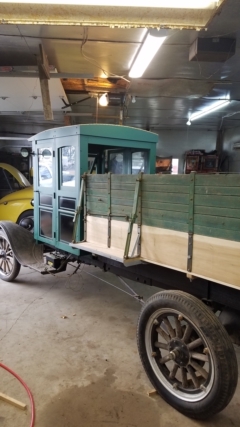 Between you and Dallas, hopefully this very special TT will be around for at least another hundred years as an example of what was possible in a world without all the future conveniences. Conveniences that would never have come into being without the creativity, and genius, of the people that made future developments possible. Dallas,Is/was your lumber wet or dry? 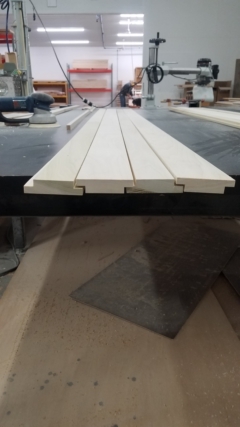 Was the spacing when new due to shrink or planed that way? Look's Very Nice!! Bud. Dry lumber Bud. The spacing was planned Im sure. 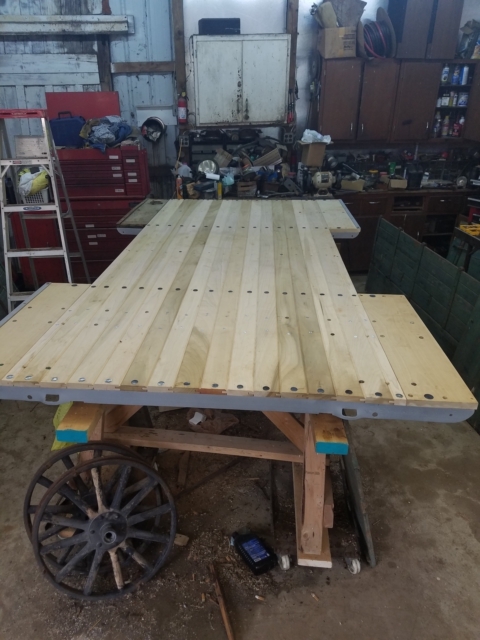 The boards are all eased " small radius" on all edges. 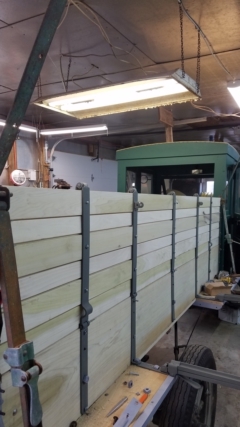 This was for operation of side panels and over lap to make a tight fit for grain. 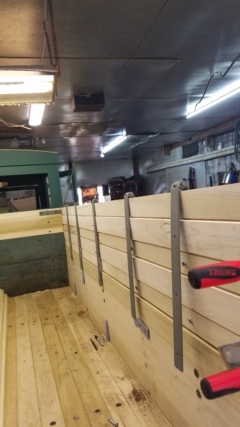 The 3/16 space makes the side boards the same 29 inches tall as the end panels. Alot of trial and error Im sure went into developing this bed. 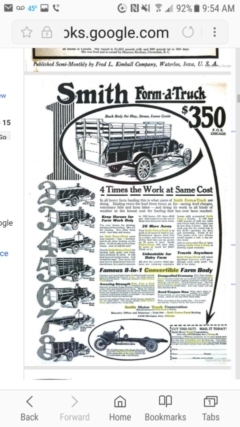 The American Wagon Co. Perfected this before motor trucks. 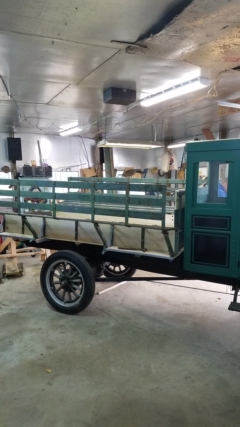 They made convertible truck bodies that were on wagon gears.As far as I can tell from my research, this company was out of business around 1922. 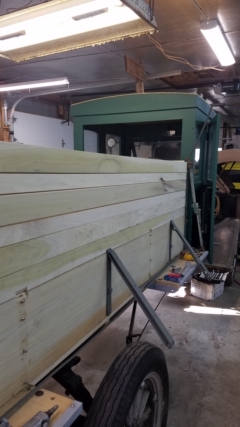 Kenneth, such spacing is absolutely necessary in making a timber bed, even more so when sides have to fold into each other as in Dallas's body sides. 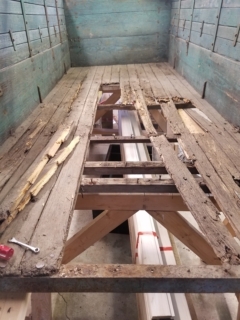 I was taught to space floor boards the same way, so that when they expand with moisture, they have room to move without cupping and pulling screws. Allen,That is why i asked wet or dry?